A vision of a northern England in which people could live in Hull, commute to Liverpool, shop in Leeds and go out in Manchester in one day has gone on show. Deputy Prime Minister John Prescott mooted the idea of a "super city" stretching from coast to coast along the M62 in February 2004. 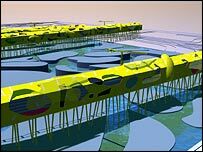 Architect Will Alsop has now unveiled his idea of how the 80-mile long, 15-mile wide conurbation would look. It will be on display at Urbis, in Manchester, until May. Mr Alsop's vision includes innovative solutions to urban sprawl such as extending Liverpool into the sea by erecting buildings on stilts up to a mile from the coast. He also proposes transforming the South Yorkshire town of Barnsley by modelling it on a Tuscan hill village, complete with its own walls. 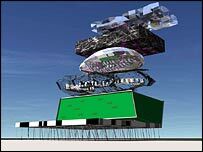 Other ideas, such as Stack - a vertical "village" where 5,000 people can live, work, worship and play - offers a twist on the skyscraper solution to population increase. Mr Prescott has said he sees a northern super city as a potential rival to London's economic power and size. Nicknamed "Prezzagrad", it would be similar to the USA's heavily populated east coast which stretches from Boston through New York to Washington. Mr Alsop insists that local identity would not be lost in such a megalopolis. "I will have totally failed if it was homogenised all across the country," he said. "The whole point of this is to celebrate individuality and uniqueness. More than anything else, people want a return to civic pride." He added: "I'm fascinated by the way people live their lives and how we might want to live in the future. "The spaces we create to work, rest and play are critical to this as are the methods we use to travel, shop and develop our agricultural environment. "Super city aims to break down conventional barriers to thought by constantly asking 'what if? ', and then converts these thoughts and visions into tangible realities which I hope will intrigue and inspire visitors in equal measure." But not everybody thinks the idea of a massive conurbation stretching from Hull to Liverpool across the Pennines is a good one. Nigel Spriggins, a lecturer in housing at Salford University, said: "I think it fills a lot of people with dread. "I'm not an architectural historian but I think a lot of these ideas are quite similar to the ideas that [Swiss architect] Le Corbusier had fairly early on in the 20th century and they never really caught on because I don't think people actually wanted them. "We haven't got the resources to build a tram line out to Ashton, for example, so the proposal that we have a massive multi-lane motorway crossing the Pennines and building loads of houses off that that... there just isn't the funding or the will to put that kind of structure in place." If this idea ever gets off the ground, I'm out of here. There's already too much development in the UK. All this smacks of crazy 1960's planning all over again. Has anyone noticed all these 'Blue sky' plans need a car? More traffic jams without proper public transport infrastructure on the way? Why would anyone want to live in an area which resembled the Northeast Corridor of the United States? Save your individualism, while you still can. That's it UK, just keep planning to cram more people into a tiny land mass, and overpower the beauty of a natural landscape and some beautiful historic architecture. Yet another good reason not to move back 'home'. A great idea to invigorate the North bringing jobs and wealth. Having spent two hours today driving from Manchester to York on a highly congested M62 the width would need to be increased to at least twelve lanes in each direction to cope with the increased demand. Why this region? It is too densely populated as it is and it is a nightmare commuting along the M62. There are many other parts of the UK which are less densely populated and in need of investment such as Wales and Scotland. The environmentalists would have field day opposing new infrastructure such as roads and if not enough new roads were built gridlock would be a 24/7 occurrence. My 4 year old child could construct better designs out of sticky backed plastic, egg cartons and washing up liquid bottles. Being familiar with his previous design idea for Liverpool he holds no credibility with me. This does indeed smack of the sixties 'outside of the box' theories, where little public consultation of the basic ideas or needs had been undertaken. It seems little heed has been paid to rising sea levels and increasing wind strengths, or the natural beauty that this project would undoubtedly ruin. One thing that does strike me is that it personifies politics and professions today - those inside have scant little idea or regard for what those outside of it want, and so on that basis, it will probably start to be built! Manchester, Leeds and Liverpool are all undergoing huge regeneration projects as it is. To encompass these great cities into one whole conurbation seems a bit unrealistic. The route over the Pennines to Manchester is beautiful, can you imagine the row upon row of non-descript redbrick housing blighting this wonderful landscape? This exercise is pure theory - it's not meant to actually happen, so don't all start panicking behind the net curtains. The point is - it's good to see an international focus on living in the north of England, and its future, social and environmental. It's really important to keep the momentum and creative energy invested into the north before it dissipates down south. Here in the Netherlands, there is the same kind of situation as in the north of England, namely a lot of cities which have to be connected and the government tries to make sure that good public transport is possible between e.g. Amsterdam and Rotterdam but the traditional character of each city is deepened. The plans of Prescott are not based on bringing the best of local architecture into realisation. Otherwise he should never have proposed a "vertical" village or a Tuscan village for that matter. It is like the north of England has no traditional architecture to be proud of. If it's anything to do with Prescott, it will cost the taxpayer millions, deliver nothing, and ultimately not be wanted by anyone in the first place....... ring any bells? This could be a good idea if carefully designed and well built. Taking pressure off of southern England and regenerating some of England's northern cities would benefit the whole of Britain. The government must ensure that transport infrastructure is properly invested in parallel with development. Given the horrors that the architects gave us in the 60's and which are being demolished today, I wouldn't trust them to build a super city. A smaller population would be a better and cheaper idea. What if the North became one city?